that pulsating cord connecting us. because of the child in her belly. as I will be born three months later. So many never have the chance. 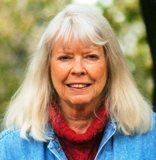 Sharon Auberle is the author of two books, Saturday Nights at the Crystal Ball: a Memoir in Poetry (currently out of print), and Crow Ink, a collection of her poetry and photographs. She is venturing into the world of recorded word, via a CD, Something After Burning, with music backup provided by some of Door County, Wisconsin's finest musicians. The poems are taken from her book by the same name, to be released in the fall. The CD is available, for $12 plus $3.50 S. & H., from the author at P.O. Box 701, Sister Bay, Wisconsin 54234. When not doing any of the above, Sharon tramps the woods near her home in pursuit of the chanterelle mushroom, which she says is having a bumper year. Learn more about Sharon here. love your poem, sharon. that line " i have not yet lived long enough to see world peace" stops my heart with sadness. the sad and poignant truth. but we'll keep singing... "i swear it's not too late"
Sharon Auberle captures a historic moment in time with great clarity. One of the wonderful aspects of this website is that it reminds readers and poets that we can read and write about anything--that is, any topic can touch us and transform us. Jayne with this website enriches the lives of all its readers. Thank you, Jayne.